The Windy City is one of the most common names for Chicago. This city is filled with an abundance of places to eat, things to do with the family and is also a center for business. Planning ahead can make your trip much more enjoyable so make sure you know what to expect before you go such as shuttle rides with local limo and taxi providers can make transfers easier. Below are some tips for those who plan on traveling to this iconic metropolitan area. Tourists flying into The Windy City are able to find plenty to do as well as getting airport rides to and from ORD airport. The city of Chicago has many types of vehicles for travelers to choose from. From shared ride vans at ORD airport, which is among the most popular way to travel, to black car services which passengers can be picked up in a luxury sedan. This provider offers shared ride vans and private shuttle vans with professional drivers throughout the downtown Chicago area from ORD airport. Specializing in point-to-point car service and limousines this Chicago provider has a fleet of vehicles that offer pick up from McCormick Place to Chicago Airport. Travelers can find black car rides to popular hotels such as Loews Chicago Hotel and Chicago Marriott Downtown Magnificent Mile with curbside pick to Chicago airport. Get picked up in a luxury sedan from ORD airport to places like Millennium Park and Magnificent Mile by this SuperShuttle service. Travelers looking for Chicago O’Hare International Airport transportation will be about 30 minutes from destination near downtown Chicago. So booking a ride early can be an important part of your trip if you want to avoid long lines after baggage pick up. Travelers can make reservations for ORD ground transportation and pre-book them in advance so arriving to your destination is stress-free. The city of Chicago is a huge metropolis at the bank of beautiful Lake of Michigan. It is famous for its lofty skyline, business centers, and an entrepreneurial community. The city offers jobs to millions of people hailing from all over the world. Apart from being a huge business center, it is famous for its cultural offerings as well. Here you will find museums, art centers, galleries and other similar structures. This is why business community and tourists from around the globe make their way here every year. To meet the traveling needs of the city ORD Airport, also known as O’Hare International Airport, serves a large area of the Midwest. It is a huge setup serving thousands of people from Chicago and its surrounding neighborhoods such as Evanston, Schaumburg, and Arlington Heights on a daily basis. 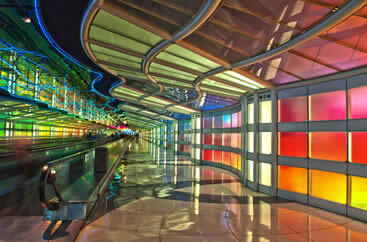 The airport is connected to a metro rail service which extends to the central parts of the Chicago City making it easy for you to get here. You don’t need to spend too much on cabs nor need to pay a huge for parking ticket of your vehicle. Get on to the local train and reach here within few minutes. Airport transfers to downtown Chicago are frequent because it is a big area and a majority of the people coming here commute through this air facility. So, you should expect a little crowd and flight delays, but this is not a regular thing. The flights are on time, services are fast, lanes move quickly, and security checks are friendly. Reserve a shared ride van, which is a vehicle that offers you a ride along with other tourists, by selecting one of our great local companies. The van will happily pick you up from O’Hare and Midway International Airports. Be sure to look out for any existing deals, which is common for certain hotels or all tourists in general. Book a private van and visit the famous Art Institute of Chicago, a school and museum that is host to all kinds of interesting events, from jewelry sales to onsite museums. For excellent deals and comfy seats be sure to contact us, a trustworthy company that offers rides all kinds of locations, including the famous Shedd Aquarium, which features life forms from all around the globe. For two-door luxury, get a private sedan and cruise around the city in confidentiality. With tinted windows, leather seats, and a crisp clear stereo sound, you’ll be driving through the 4th largest city in America with speed and ease. While you’re moving through the city streets, visit Magnificent Mile, an exciting building filled with shopping, architecture, history, and a variety of interesting museums. Privacy isn’t just a luxury for those traveling alone or with one person – you can also get your own SUV, a great vehicle for families on the move, so whether you’re here for vacation, your kids baseball tournament, or both, you’ll be sure to have a good time, a great company that’s always happy to help families. In your free time, visit iconic city landmarks like Cloud Gate and Wrigley Field for a sense of awe and history. If you’d like to see something extraordinary from an even better perspective, book a luxury limousine. See the best Chicago has to offer by visiting luxury hotspots like the Palomar Chicago, a hotel with boutique shops and high-end cafes. If you’ve got a craving for some world-class dinner, you can also check out tasty restaurants like the highly buzzed-about Alinea, a New American food destination that is known for its rare openings and exclusivity. For something that is just as classy, but more easy to get into, try out Tanta Chicago, a delicious Peruvian restaurant located in the heart of Grand Avenue. If you’re traveling with a large group, then you probably know that it’s a little difficult getting around together, especially in such a crowded city like Chicago. See more than you ever thought possible by renting out a chartered bus, seeing amazing group locations like Water Tower Place, a massive indoor mall with interesting boutiques and world-class brands. Another great place to check out during the day is Jay Pritzker Pavilion, a fun outdoor concert, park, and recreation center. Your first time in Chicago? The city of Chicago is very busy so if you are traveling here for the first time get to know the city before your trip. It can be the difference between a happy memory and a frustrating visit. Choose Chicago is a popular resource for those wanting to learn more about the area, things to do and places to visit in Chicago by taxicab services available throughout the area. If you are coming to Chicago during the winter time then prepare for it to be very cold. With temperatures plummeting into the 20’s you will want to bring your coat, gloves, hat and most likely a pair of boots. Your airport driver is very knowledgeable of the area so he can be a great source of information when you arrive. The entire city of Chicago is beautiful and pleasant to visit but a tip for those business travelers and vacationers who normally book rides for O'Hare airport transfers near the Loop, it will help save you money to stay in downtown Chicago instead. You will find some reputable hotels with a convenient location for shuttle bus rides in the downtown area so it’s a great alternative to the Loop. This can save you money and help you enjoy your trip. You can buy vouchers with the Chicago CityPASS to 5 of the area’s top attractions. The Chicago CityPASS includes vouchers to some of Chicago’s most beloved points of interest which you’ll want to make sure to visit before you leave town. As many people know, Chicago is famous for its deep dish pizza and it’s hot dogs. But little do many know, it has some of the best steaks around, especially in the Loop and North Side. So when you decide to grab a bite to eat and you are a steak lover try considering an alternative to the norm, you’ll be pleasantly surprised. The airports 2 major airports in Chicago are located near many of the best hotels and attractions in the area for Chicago O’Hare International Airport and Chicago Midway International Airport for travelers coming to the city whether it is for business or personal. Tourists coming to ORD airport can find a wide selection of vehicles from GO Airport Express who can provide low airport transfers for shared ride vans and Chicago Gold Coast Limousine who offers great deals on Private SUV services. Travelers can find a great assortment of hotel stays with shuttles in Chicago with many styles for everyone budget such as the The James Chicago, the Sofitel Chicago Water Tower or even the Trump International Hotel & Tower Chicago. Bohemian House, Eddie V’s Prime Seafood for unique fish as well as steak plate and Au Cheval for those wanting a hamburger with friends and family. You can visit the Art Institute of Chicago by catching a quick taxi there where you can view many displays such as the Van Gogh works of art or Millennium Park which is located in the area’s popular the Loop featuring collections of art and exhibits.